I have written about zoo patterns in my post titled Transferware Zoo Patterns #1, but here I want to focus on Zoological Gardens by Ralph & James Clews (1814-1834). 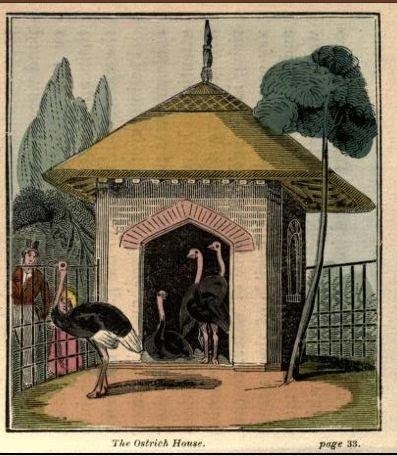 The London Zoological Gardens opened in 1828 to great fanfare. 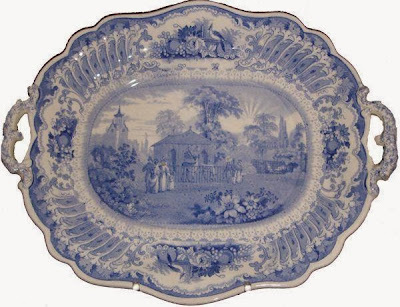 As the Staffordshire potters often capitalized on popular culture, many of them printed zoo patterns on their dinner and tea services. 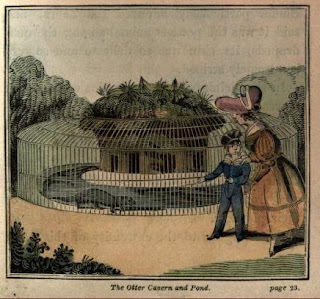 Zoological Gardens features different animal enclosures on most sizes and shapes. 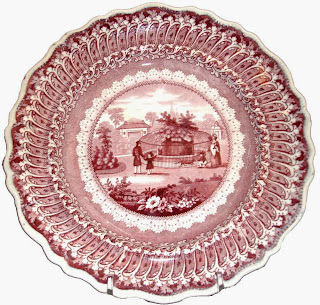 The lacy border and fairly realistic center patterns seem to be a bridge between earlier 1820s patterns and 1830s Romantic patterns. The center patterns were often copied from illustrations of the actual zoo. Below is a 17.25 inch by 14 inch platter that features the Brahmin-Bull House. The source print for the platter was created by George Scharf the elder (1788-1860). Scharf was a well-known artist and lithographer who did many illustrations of early 19th century London. 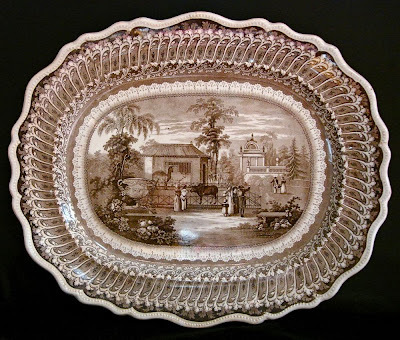 Zoological Gardens by Ralph & James Clews, 17.25 inches by 14 inches platter, ca 1830/Other ruminants in the enclosure are a llama and a cow. 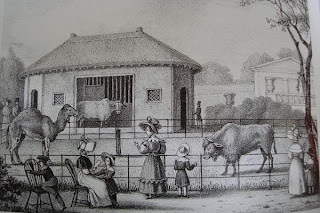 Clews also copied the artwork found in an early zoo guidebook for children titled Henry and Emma's Visit to the Zoological Gardens, In The Regent's Park by James Bishop, 1830. 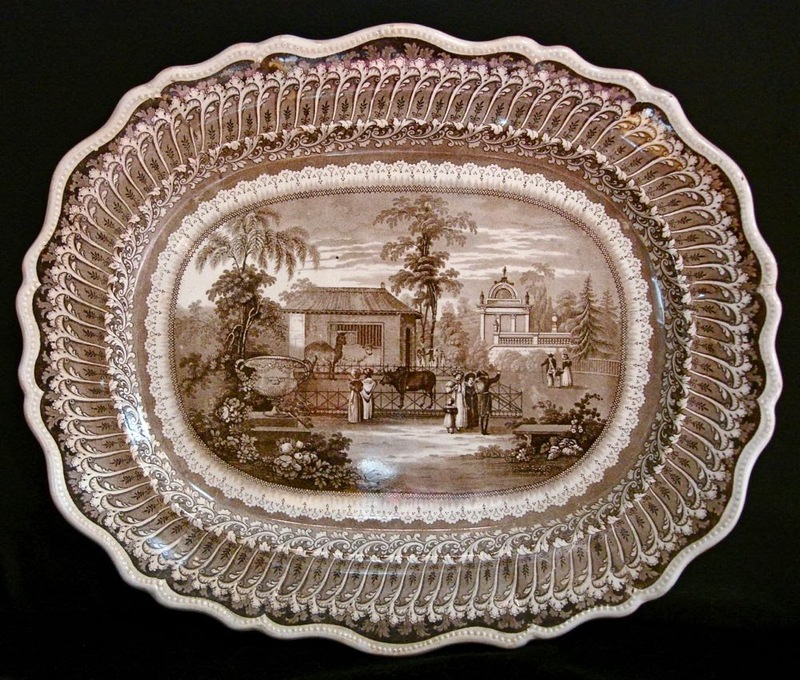 The platter to the right shows the Ostrich House. The source print is below. 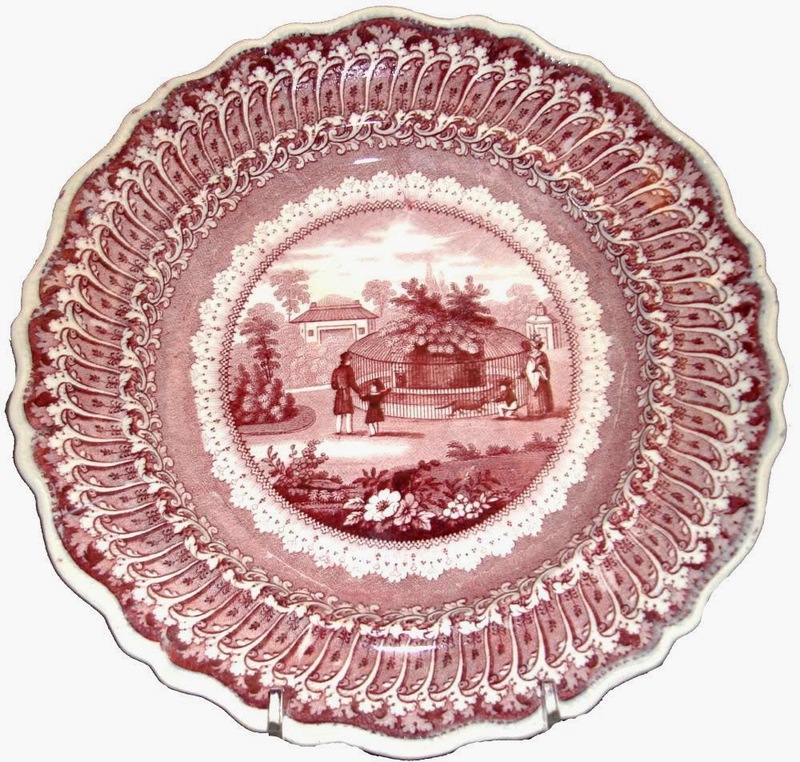 Another pattern copied from Henry And Emma's Visit is The Otter House, which is seen on an 8 inch plate and its source print below. 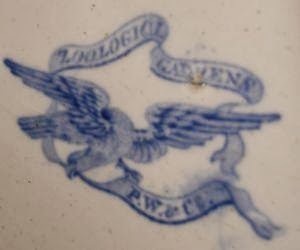 A few years ago I purchased a Zoological Gardens soup tureen undertray in blue, but the mark had the initials for Podmore Walker & Co. (1834-1859)! 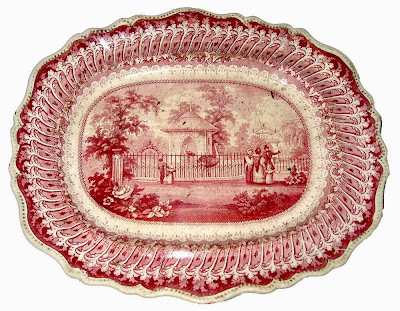 Unlike the Clews' items, the tray is poorly printed and the already busy border includes a cartouche filled with bird, flowers and fruit. 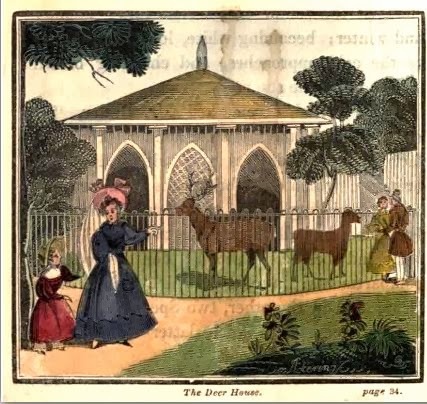 The pattern is The Deer House (see the source print below). It appears that Podmore Walker & Co. may have purchased the copper plates when Clews went bankrupt in 1834. 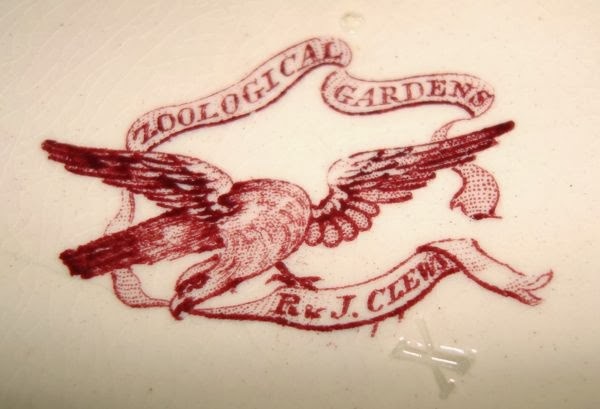 Pottery printed with zoo patterns gave the general public a look at what was in the zoo. You may wonder why people didn't just go to the zoo, but the London Zoo was not open to the public until 1847!